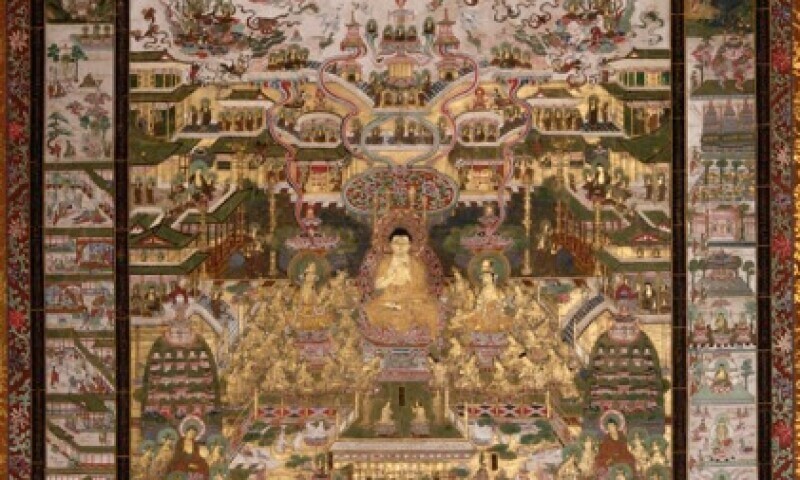 Taima mandala, Edo period, 18th century, collection Viktor and Marianne Langen. The Japan collection of Viktor and Marianne Langen is unique in scope and quality in Europe. With around 350 works, it gives a representative overview of Japanese art from the 12th to the 20th century. The collection includes not only religious art, but also ceramics from the prehistoric Jomon period and Buddhist statues of the Nara and Heian period. The wide range of paintings ranges from examples of courtly painting of the Kano school to works by renowned artists such as Maruyama Okyo (1733-1795) and genre painting of the 19th century.